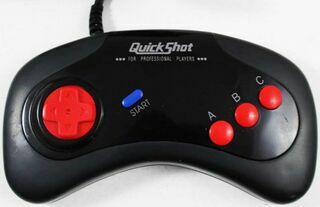 The Starfighter 3B is a third-party Sega Mega Drive controller manufactured by QuickShot. It is part of their Starfighter series of controllers, and as the name suggests, is a simple, no-frills three button pad. The Starfighter 3B would be superseded by the Starfighter 3 Plus 3, a six button variant with turbo features. It was also sold by TecnoPlus as the Mega Control Pad.